For those of us lucky enough to not have to wear the company logo to work, we have fashion decisions to make. Do we bring our fashion sense to work, dress conservatively or wear what reflects our interests, hobbies and passions? Nowhere is fashion more hard at work than on the opera stage where the opera production dictates the costumes. Costumes indicate the time period, socioeconomics, who the leads are, where the action takes place and sometimes even what is going to happen. 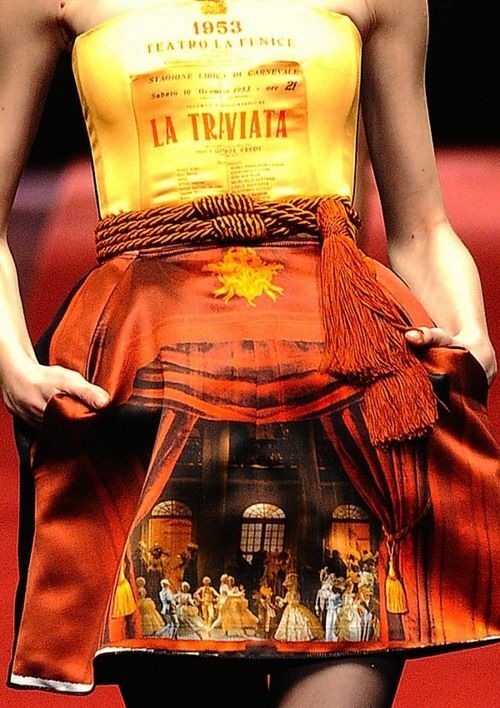 Opera fashion can also influence opera house architecture as well. And architecture returns the favor. 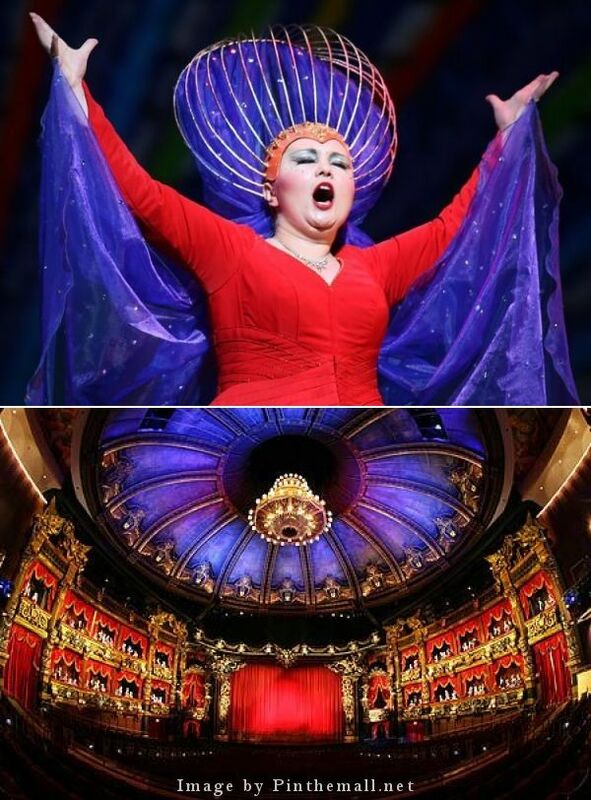 Albina Shagimuratova never performed on this Phantom of the Opera stage in this costume, but the colors, shapes and textures are a direct match, no? This is Renata Tebaldi’s costume from Manon Lescaut paired with the coral tree garden of the Disney Concert Hall in LA, indicating that old world fashion can still influence modern architecture. The design on Barbara Fritoli’s costume reflects a similar pattern on the curtain of the Odessa Opera House. The lenticular fabric of Renee Fleming’s gown reflects the orange, black and light lavender of the Royal Albert Hall in this picture. Modern Block Color Throwback: Shirley Verrit 1973/The Queen’s Theatre at Trianon, Versailles, 1780, Architect: Richard Mique. The ruff of Edita Gruberova’s Maria Stuarda costume mimicking the roofline of the Sydney Opera House. I doubt that there was a direct design correlation between any of these pairings, yet it is as if there are some fantastically weird fashion/architecture archetypes out there that get repeated again and again. Want to see more examples of fashion influencing architecture and vice versa? Visit me here on my Pinterest board, Fashion/Architecture Meet in a Night at the Opera. And take a look at the original pictures which inspired the board. *Do not promise what you KNOW you cannot deliver. Sometimes factors change and what you thought you could accomplish changes. Make your customer or supervisor aware from the get-go that what you want to deliver is contingent upon those very factors that might change. For example, material costs may go up during the project, or you may need more personnel hours to accomplish the job. Saying that you can do a job and hoping you can figure it out later just does not work either in a business or any other work setting. *Get your facts straight. Plan your project from the beginning by projecting costs, personnel hours, delivery times, etc. In other words, have a plan to accomplish what you promised and be able to articulate it. *Do your research. Make sure you have all the tools you need to deliver what you promised. Retrench and assess during the project to ensure you still have what you need to bring the project to completion. *Stay in touch. Good communication skills, both oral and written, are essential to keeping your professional reputation intact. Do not surprise your customer or supervisor with doubled costs, delayed or missed deadlines. Being up front is the best way to keep your project on track and get the necessary materials and support you need as factors change. *Evaluate your own performance and get the customer’s or supervisor’s assessment as well. Feedback gives you an opportunity to improve your services or work. There is lots of talk about raising the minimum wage on a state-by-state basis. I’ve seen the figures $11+ to $15 per hour tossed around, mulled, worried over. Will it push smaller companies into bankruptcy, force larger ones to hire fewer people? What about those already hired? Yes, they will get more money, but will they be doing more work because companies will hire fewer people? Will consumer goods and services costs rise as companies pass the cost along to the consumer? These are all real worries, but there is something else that economists are not really considering. What about the companies who offer their employees $11 to $15 an hour right now? They justify these not-so-high wages by saying, “At least you are making above the minimum wage.” Will they also consider wage hikes to keep their employees satisfied? Something to consider as more jobs open up and employees start to think about moving on to more profitable pastures. Hiring managers complain that there is no longer company loyalty on the part of employees. Yet how loyal are employees going to be when companies continue to use “the poor economy” as an excuse for low wages? The economy has been on the rebound for awhile now with more jobs opening up, yet wages have remained stagnant. Incentive to move on, yes?